I’d never encountered Jon Loomis’ poetry before. But I was delighted to make the acquaintance of both poet and poetry at the Foot of the Lake reading series in the Thelma Sadoff Center for the Arts in Fond du Lac. Winner of the 1997 FIELD prize in poetry, Loomis published his first and second books of poetry in 1998 and 2001 (Vanitas Motel and The Pleasure Principle, both by Oberlin College Press). He then turned his craft to writing mystery/detective fiction, creating four novels in the Frank Coffin Mysteries series during the 2000s. Readers of Loomis’ poems will be thrilled to know he is back to poet-ing. 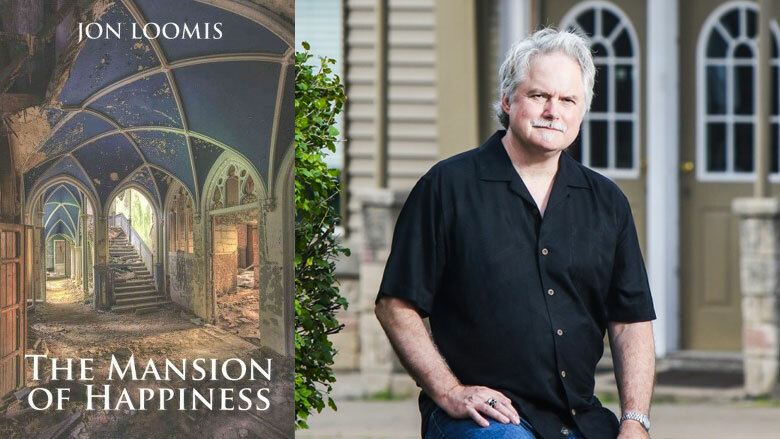 With The Mansion of Happiness: Poems, his first book of poems in more than fifteen years, Loomis is sharper than ever. His verse reflects a self-deprecating sense of humor and a wry take on life. The Mansion of Happiness begins with the poet/narrator’s demise, a familiar trope for most writers who find their grounding in writing about life, death, and love—and the myriad metaphors which lie therein. my body—Jesus, I’m fat. Somehow I’m missing a shoe. Written in free verse, these poems are mostly constructed in tercets. Many of them end in ellipses, as if there is more to say, more mystery, the poet wanting the reader, perhaps, … to fill in the blanks. I’ll show you my trucks. While Loomis begins The Mansions of Happiness with a poem about the poet’s demise, readers are brought full circle with his last, “If I Come Back,” a poem that imagines a second chance at life, a narrator who wants to return as a tree, a maple, “a crimson throb,” someone who might let the dog off the leash once in a while. Someone who might get it right this time. If only.